A new chapter begins for Pakistan as AflaPak ceremonially changes hands at its official launch. Captured for posterity here, the moment when AflaPak’s active ingredient – the friendly fungi that crowd out the toxin-makers – is passed on from CABI, in the persons of Dr Aamir Humayun Malik, Deputy Director for Development (holding AflaPak on the right) and of Dr Sabyan Faris Honey, Project Manager (right of table), to Rafhan Maize Products, in the person of Mr Usman Qayyum, CEO and Managing Director (holding AflaPak on the left). As this powerful product takes off, we’re proud to be helping Aflasafe’s youngest cousin tackle the aflatoxin challenge on a new continent. Pictured are: (top row, left to right) Mr Jeff Goebel, USAID Acting Deputy Mission Director; Ms Deborah Hamilton, USDA-FAS Senior International Trade Specialist and Chief of Party for Pakistan Programs; HE John Hoover, US Embassy Deputy Chief of Mission; Dr Alejandro Ortega-Beltran, IITA Plant Pathologist; Dr Anjum Munir, Director of PARC Crop Diseases Research Institute (representing Dr Yusuf Zafar, PARC Chairman); (bottom row, left to right) Mr Casey Bean, USDA-FAS Agricultural Counselor; Dr Lloyd Garcia, USDA-FAS Agricultural Officer; Dr Khalid Aziz, Manager of Rafhan Maize Products; Mr Usman Qayyum; Dr Sabyan Faris Honey; Dr Aamir Humayun Malik; Mr Muhammad Shafique, Rafhan Deputy Manager, Agribusiness Development. While Aflasafe is a product exclusively for and of Africa, our team’s expertise and achievements are spilling beyond Africa’s shores, receiving recognition across the world. 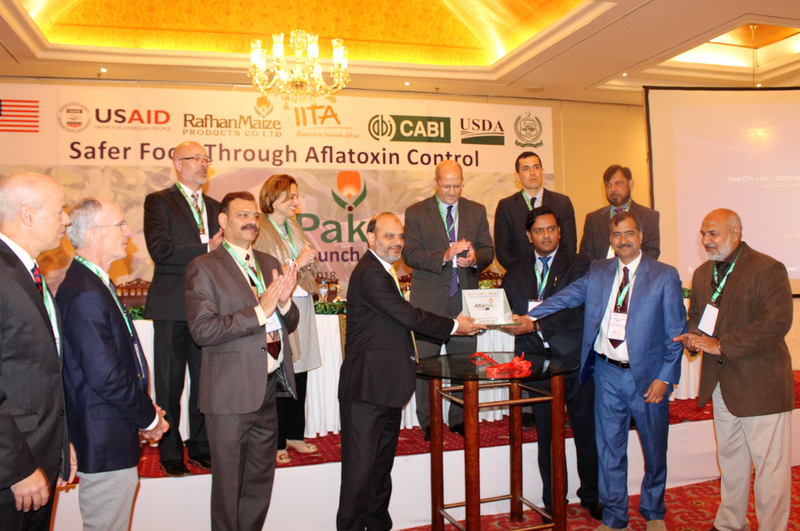 In October 2018 our very own Alejandro Ortega-Beltran took the first step in a brand-new relationship, travelling all the way to Islamabad, Pakistan to attend the launch of AflaPak, a similar locally tailored aflatoxin-control product that is getting a helping hand from IITA. AflaPak is being developed by the National Agricultural Research Centre (NARC) of the Pakistan Agricultural Research Council (PARC) and private company Rafhan Maize Products, with support from the United States Department of Agriculture (USDA) Agricultural Research Service (ARS), the USDA Foreign Agricultural Service (FAS), and the United States Agency for International Development (USAID), who are also generous co-funders of Aflasafe. The Centre for Agriculture and Bioscience International (CABI) is facilitating and managing the implementation of the activities in Pakistan. IITA scientists, led by Dr Ortega-Beltran and Dr Ranajit Bandyopadhyay, will be providing technical support and backstopping. This will include training Pakistani staff; providing technical and scientific advice during the product research and development process; sharing ideas on how to successfully register the product in Pakistan, and communicating to government officials how the natural biocontrol approach works and how powerful it has been in the case of Aflasafe. 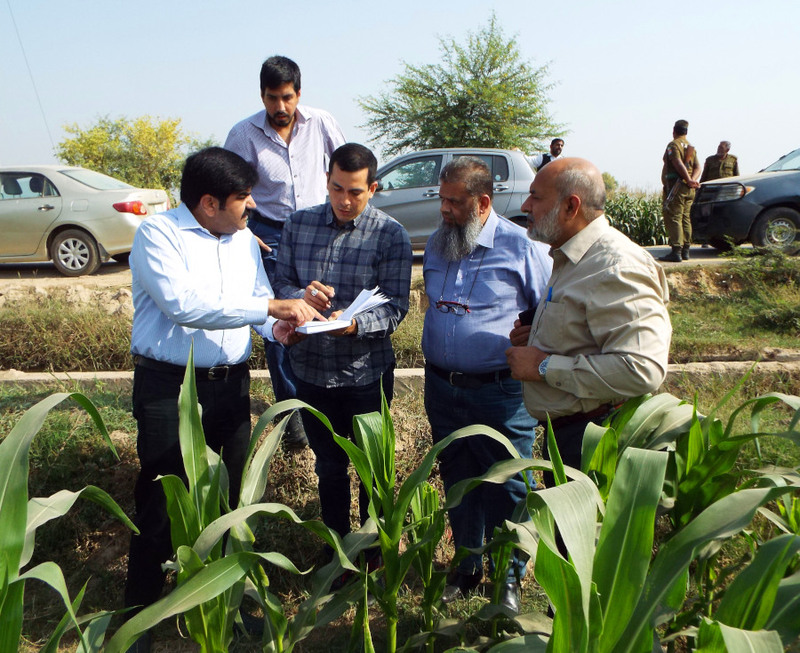 Dr Alejandro Ortega-Beltran (centre) gets into detail and gets his hands dirty on a visit to maize fields in Faisalabad, as he discusses when to apply AflaPak with Pakistani colleagues Dr Hamzah Shahbaz (above), CABI Project Manager, and (left to right) Rafhan Maize Products agronomists Mr Muhammad Imran, Mr Abdul Qureshi, and Mr Muhammad Shafique. Such field visits provided opportunities for focused and in-depth discussions, and for technical advice on applying Aflasafe, setting up trials, and sampling to measure aflatoxin levels. It is envisioned that IITA’s support will continue through training, testing and exchange visits, as well as lots of advice and knowledge-sharing. The week-long trip was a great success. Dr Ortega-Beltran provided technical knowledge and support at the AflaPak launch, giving a presentation on the science behind the approach and its proven effectiveness. He enthralled the audience with the urgency of the menace and credibility of the solution: 30 minutes after his talk ended, he was still responding to a flood of questions. Our ‘Aflasafe Ambassador’ was warmly received during the visit by NARC, the United States Embassy in Pakistan, USDA and USAID, with whom he discussed and helped shape future plans. He also evaluated laboratories and production facilities so that he could prepare some preliminary advice. We are delighted by this cross-continental recognition of our expertise and of Aflasafe as a cutting-edge product. “It is a matter of pride for us that partners see IITA as a leader in aflatoxin biocontrol research and are seeking our assistance outside our normal sphere of operations in Africa,” said Dr Bandyopadhyay.